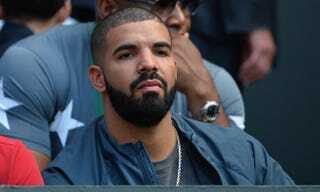 Drake watches a women’s semifinals match at the 2015 Wimbledon Championships in London on July 9, 2015. Rapper Drake—who clearly is a major sports fan—might want to back up off the young pups, since his presence has apparently violated NCAA rules, not once, but twice, according to the Bleacher Report. The No. 9-ranked Kentucky Wildcats men’s basketball team had to self-report a minor rules violation involving the rapper for the second time this October based on a simple photo the rapper took with Wildcats point guard Tyler Ulis at a concert in May. Coach John Calipari’s Wildcats self-reported the first violation involving our favorite bearded Canadian MC after a recruit for the team posed for a photo with him at Kentucky’s 2014 Big Blue Madness event prior to the first practice of the season, according to the Bleacher Report.